I have joined a great group of bloggers who promote the importance of sitting down together for dinner, if not everyday then at least on Sundays. 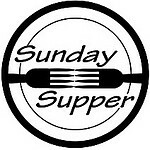 Each week features a theme that readers can follow through Twitter with #SundaySupper. This week we will honor the wonderful Julia Child in celebration of her 100th Birthday on August 15. The event is hosted by Samantha of The Little Ferraro Kitchen. Below is a list of all the participants and their dishes for you to check out Sunday. And to make this week even more special, PBS Food will join us in our Sunday evening Twitter chat in connection with their #CookForJulia celebration. Our blogs will be up early Sunday morning. Mine will features Julia’s French-Style Country Pate. Come join in on the fun! White Bean Dip with Homemade Tortilla Chips- www.mommasmeals.wordpress.com. This cake is so good looking that I am willing to eat after having a good meal in a short time. I am really interested to know about the place that had been making it good atmosphere.